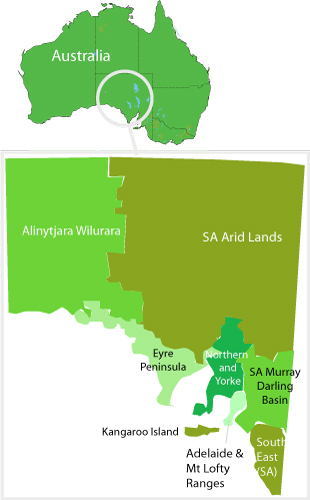 South Australia shares borders with all of the other mainland states and with the Northern Territory; it occupies a uniquely central position for campervan enthusiasts who wish to tour Australia. The state's colonial origins are unique in Australia as a freely settled, planned British province, rather than as a convict settlement. Official settlement began on the 28th December, 1836, so the state still has a long and interesting colonial heritage. Mainly known as the home to the famous Barossa and Clare Valleys, South Australia has so much more to offer in the way of beautiful scenery and delightful experiences. Visit some of the state's national parks & forests to cross paths with the local wildlife in their natural habitat, or adventure to the limestone cliffs, volcanic craters, caves and fossils that date back millions of years. With such contrasting experiences such as the elegant and arty Adelaide to the rustic Coober Pedy, the Opal Capital of the World, a campervan journey through South Australia has so much on offer; you may never want to leave.